When it comes to vegan cooking, it’s all about the dressing or sauce! That’s the secret to enjoying the healthiest foods on the planet: fruits, vegetables, whole grains, legumes and beans, nuts and seeds. And when it comes to quick and easy preparation…I’m all about batch cooking. Yes, if you’re cooking things like roasted vegetables, quinoa, brown rice, chickpeas, lentils and toppings like Sweet and Spicy Almonds, why not double or triple your recipe? Store some in the fridge and freeze some for later. Open your fridge- and voila you have a palette of plant-based foods to chose from. 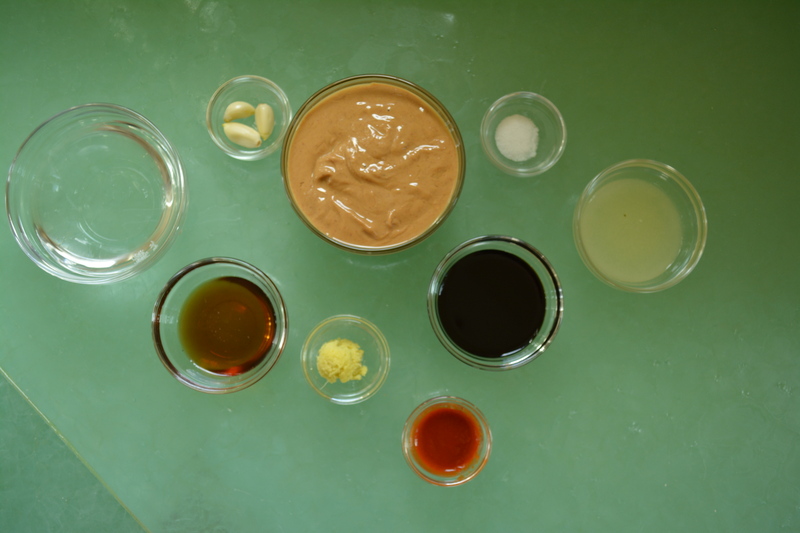 Starting with the water on the upper left and going clockwise that’s garlic, natural peanut butter (without any added oils or sugar), salt, lime juice, soy sauce, Sriracha, minced ginger, and maple syrup. This is a wonderful whole food plant-based sauce. In other words, it is made from whole minimally processed ingredients without any added oils and sugar. The next step is simple. Add all of the ingredients to a blender. Blend them until smooth and pourable, adding more water if necessary. Keep in mind that the sauce will thicken as it becomes cooler in the refrigerator and you can always add a bit more water later if necessary. I love to keep a batch of this Asian Peanut Sauce in the fridge for bringing all sorts of dishes to life like Rainbow Buddha Bowl, Spicy Asian Salad and Pad Thai /Peanut Noodle Stir Fry. All of these dishes are nutrient rich, relatively low in calories, complete devoid of cholesterol and full of antioxidants and phytonutrients. And they follow the Healthy Vegan Made Easy system so they can be prepared with little time and fuss. Make a big batch of this creamy, sweet and spicy sauce to dress a salad, drizzle over a Buddha Bowl or to pour over brown rice noodles. Add all of the ingredients to a blender. Blend until smooth and pourable, adding more water if necessary. The sauce will thicken as it becomes cooler in the refrigerator. Note: It is possible to make this sauce without a blender, if you mince the garlic first. In a large bowl, whisk together all of the ingredients. I love your website. Just stumbled across it. I am new to a whole foods, plant-based diet, and your recipes look great. Thank you so much. Anyway, I thought your recipes are nicely laid out, and the pictures look almost as good as the food taste. Thanks again.